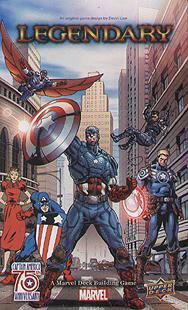 Celebrate Captain America\'s 75th Anniversary in this new Legendary expansion. In the latest expansion for the critically acclaimed Deck Building Game, Captain America is joined by several of his allies such as Sam Wilsor and Agent -13, not to mention 194 Cap himself! Build your heroic deck to fend off the latest masterminds, Baron Heinrich Zemo and Arnim Zola! New Keywords and Mechanics await in the latest from Legendary: A Marvel Deck Building Game.